Carp -- Queen of Rivers or Pig With Fins? From the Carp Guy: Asian carp are more abundant than last year. Consumers have less money to spend in restaurants. Restaurants are serving more local, naturally grown foods. Local commercial fishermen are selling carp cheap. All of the forces are aligning to create a new interest in carp dishes in the Upper Midwest.— Reggie McLeod, Big River editor / publisher, aka "The Carp Guy"
Big River and the Carp Contest in the news! "The Carp Special?" WXOW in La Crosse, Wis.
"Magazine Editor becomes Carp's Champion" Post-Bulletin, Rochester, Minn.
Big River is determined to get restaurants on the Upper Mississippi to begin serving carp. We’ve been talking about this for years, and we’ve finally thrown down the gauntlet. The Big River Carp Connoisseur Challenge is offering to make innovative restaurants famous on the Upper Mississippi. No doubt the word will spread, attracting discriminating diners from around the world to sample the fare of the fortunate recipient of this soon to be cherished award. 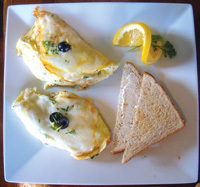 After two years with no entries in the Big River Carp Connoisseur Challenge, the 2011 contest brought in two toothsome entries: Mrs. Sippy’s River Town Bistro in Trempealeau, Wis., started serving Smoked Carp Omelet, and the Bluegill Cafe & Coffee Haus in McGregor, Iowa, started cooking up Carp Chowder. Both restaurants are fairly new, Mrs. Sippy’s less than a year and a half old and the Bluegill opened less than a year ago. Both, too, have shown a spirit of adventure by putting tasty Mississippi River carp on their menus. Now, let's get some more restaurants involved! We challenge all river cafes, diners and restaurants to serve us up some carp. We are issuing a Call for Entries to the 2012 Big River Carp Connoisseur Challenge! Check out the details here. For years river biologists and anglers have been alarmed by carp invasions of the Upper Mississippi. Now three new species — silver, grass and bighead carp — are settling into our stretch of the river. The commercial fishermen who harvest carp from the river usually smoke a few and sell the rest to the “ethnic” market. Who is this ethnic market? Asians make up some of it. People have farmed carp in China for more than 2,000 years. Today carp species make up eight of the top 10 aquaculture species in Asia. 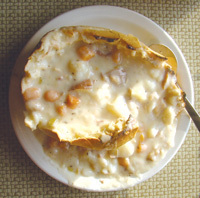 In Eastern Europe baked carp is a delicacy reserved for Christmas dinner and other special occasions. Carp is one of the ingredients in gefilte fish, which, if you have not had the pleasure, is sort of a fish sausage served cold. Bottom feeders! Ducks and geese are bottom feeders — so what!? Carp eat plants and algae. They’re at the bottom of the food chain, with cows, pigs and sheep. In much of the world, folks hand over good money for carp, while we in the Midwest pay through the nose for salmon, blue-fin tuna, cod and other overpriced endangered fish, while carp (now that the silver carp have arrived) are literally jumping into our boats. Many of the best restaurants brag that they use local ingredients, but not carp. We need some leadership from our river-chef community. When I Google “carp recipes” I get 489,000 hits. There are bound to be some real winners in there. Get out those baking pans and get cooking! If we work together on this, someday soon we will enjoy the best carp eating in the world. The river will be healthier. We will be healthier. The economy of the Upper Midwest will be healthier.